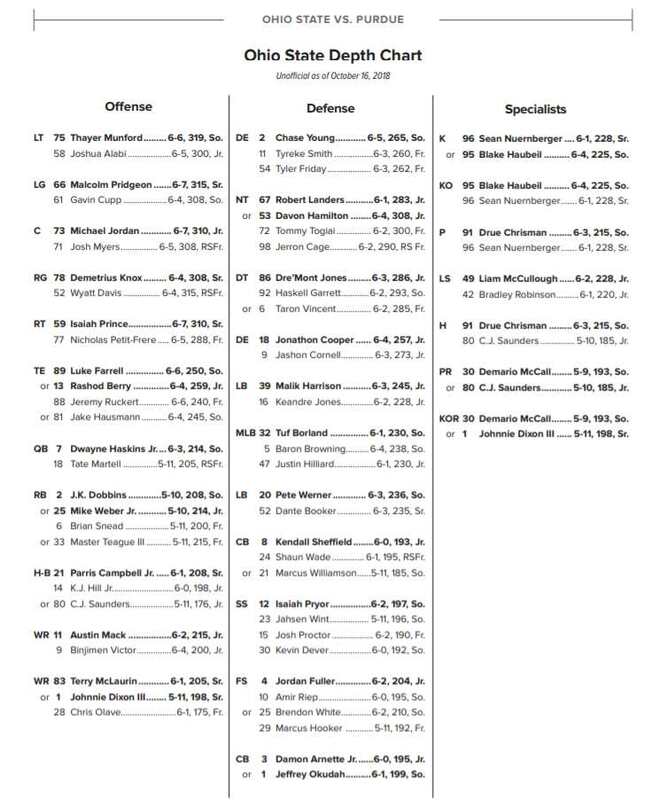 The 2019 Spring Game was a big draw for former and future Buckeyes. That’s because while it showcases the the current team, it is also a big weekend for Ohio State football recruiting. Ryan Day and his staff turned the weekend into a major event, bringing back a number of former Buckeye stars. Among them were Heisman winner Eddie George, Ezekiel Elliott, Michael Thomas, and Dwayne Haskins. That’s a lot of star power for an intrasquad scrimmage, but they were there for a reason. And a lot of planning goes into a weekend like this one. The weekend is a logistical nightmare, with the Buckeyes welcoming in already-signed players who will be college students in a couple months, all the way down to current high school freshmen. First, those 2019 signees get a taste of what’s to come. “They’re actually allowed to do a workout with (strength coach Mickey Marotti). That’s great, see where they’re at and find out where they are in their progress. Have meetings with them on football, different things,” Day said. But the vast majority of the weekend is focused on players who haven’t signed yet; in the classes of 2020, 2021, and even 2022. “Great chance for those guys to see what game day is like, and the amount of people who show up for our Spring Game is extraordinary here. That’s a huge selling point for us,” Day said. The results from this weekend were solid. Lejond Cavazos, a 4-star defensive back prospect in the class of 2020, committed on Friday. But the stars really came out on Saturday. That parade of former Buckeye greats were there to greet an impressive list of possible future OSU players. You can see some examples below, but it’s not a coincidence that one of the most famous OSU wide receivers is posing with a top wide receiver recruit like Marvin Harrison, Jr. Or that Dwayne Haskins is with the program’s top QB target in the 2021 class, Kyle McCord. Or that a potential CB like Cavazos was spending time with Denzel Ward and Marshon Lattimore. 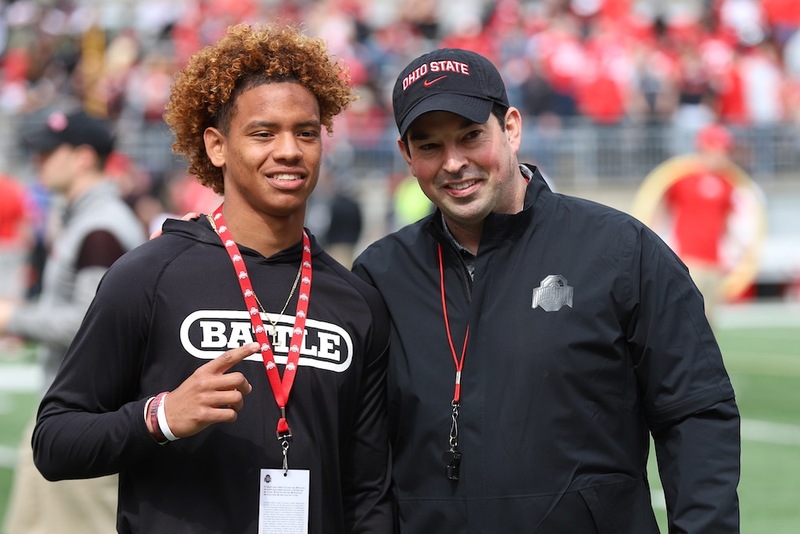 The Buckeyes also got a number of their 2020 pledges together, including all three in-state offensive line commits. All afternoon, the mood down on the field was fun. Without the pressure of a game that really mattered, players and coaches had more time to talk with recruits than they would during an autumn Saturday. And without the NFL playing on Sunday, a lot more big-name former OSU stars were able to make it back to the Horseshoe. As of Sunday evening, the Buckeyes are still sitting at one commitment for the weekend. But based on the reactions on the field and on social media, the impact of the 2019 Spring Game could be felt for a long time to come. A pair of 2021 Ohio DEs who visited this weekend: Najee Story and Jack Sawyer.